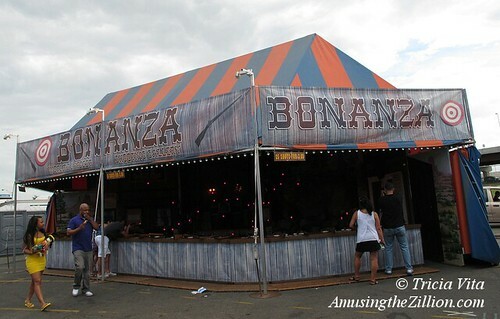 The midway at New Jersey’s State Fair Meadowlands, which runs through July 7, is alive with eye-popping painted showfronts for funhouses, entrancing sideshow banners, and flashy signage hawking fair food. 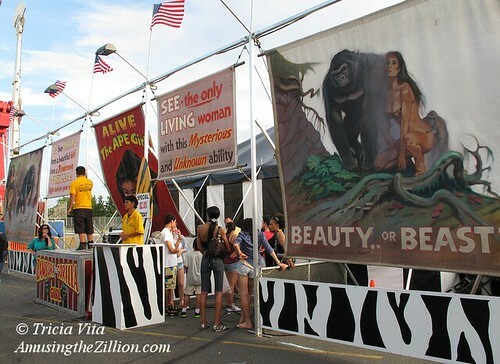 We’ve been going to the fair in East Rutherford since 1996, when Johnny Meah’s eighteen-foot-high, 104-foot-wide showfront for Hall & Christ’s Weirdest Women in the World first lured us there, on assignment from Raw Vision to write about the art of the sideshow banner. It’s the front of the show that gets the dough, and it’s the front of the show that continues to attract our interest. 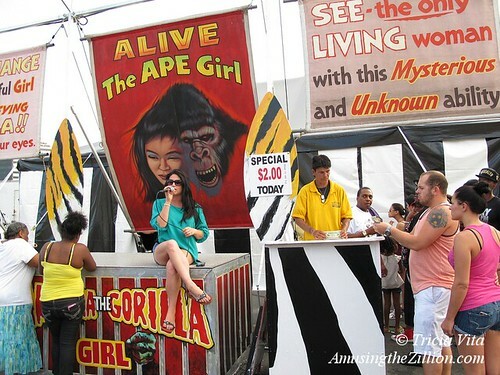 This year, the fair has a Girl to Gorilla show, which hasn’t been on the road since 1996, and four other sideshows owned and operated by Lindsey Constantine. She learned the business, including how to talk on the bally stage, from her dad Jack Constantine, who started Four C Productions in 1972 and is now semi-retired. “Beauty or Beast? 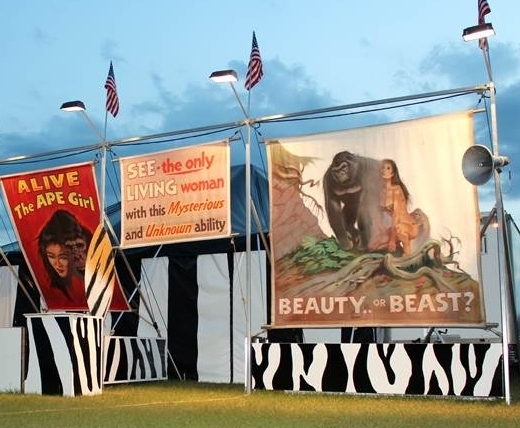 SEE the only LIVING woman with this Mysterious and Unknown Ability…Alive…The Ape Girl.” This awesome set of Girl to Gorilla banners was painted by the late Lew Stamm, whose showfronts are highly regarded in the business. 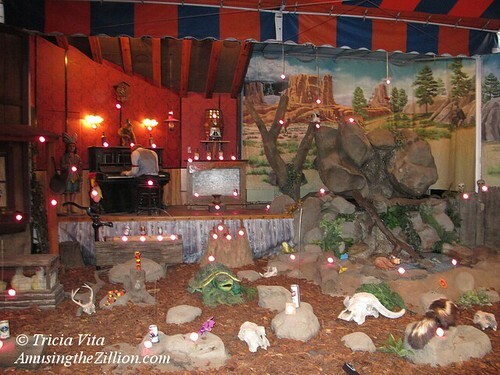 He also did projects for amusement parks such as Gold Rush Junction, Silver Dollar City, Dollywood and Dixie Stampede. “They were done for my father in 1991. My dad traded his car for them,” said Lindsey. Across the midway is the World’s Smallest Woman, whose delightful advertisement has her sitting in a giant chair dwarfed by a “normal-sized” dog. The showfront trumpets her as being only 29 tiny inches small with hands 2 inches wide. This particular “World’s Smallest Woman” is named Gloria. 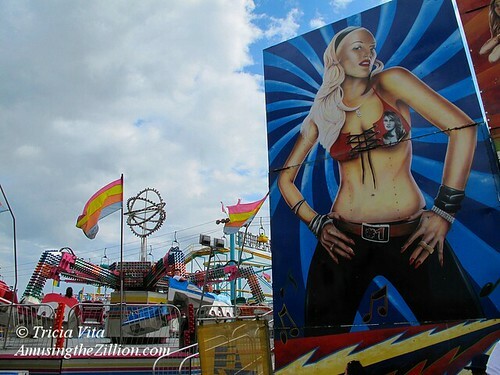 For nearly 30 years, she has supported her family as one of Four C Production’s five “World’s Smallest Women” who travel the U.S. carnival and fair circuit. 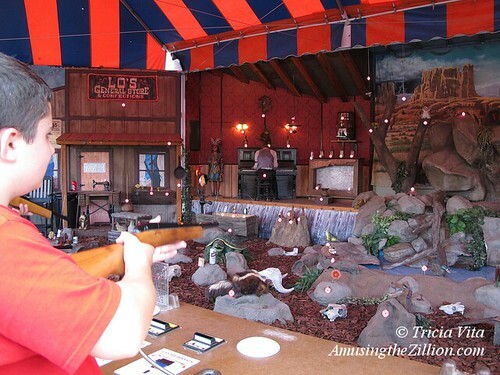 Four C’s World’s Smallest Horse, Snake Illusion and Oddity Museum featuring such attractions as a Giant Nuclear Radiation Beetle and a Fiji Island Mermaid are also on the midway at the New Jersey fair. The hot, humid weather is perfect for Drown the Clown, the great Joey Liberti, who has been working the dunk tank since he was a kid. The ballgame/show was a fixture at Little Italy’s San Gennaro Festival until last year, when a group of swank boutiques and new residents of Mulberry Street in the neighborhood now called NoLita lobbied the community board to shorten the festival. Although they were unsuccessful, Drown the Clown was one of the casualties of the gentrifiers’ efforts to take the carnival out of the street fair and make it culturally and politically correct by their standards. Ironically, century-old photos of street fairs in New York City and elsewhere in the U.S. show an array of ball games, as well as sideshows and Ferris wheels. 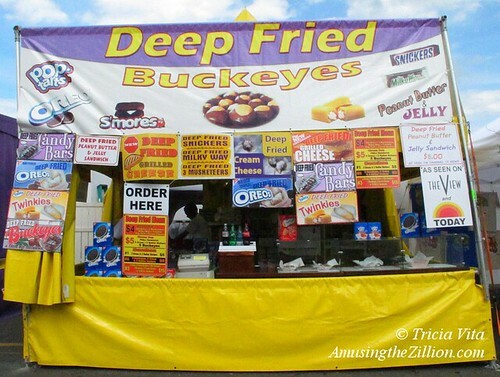 Deep-fried Buckeyes, in case you’re not familiar with fair food, are an irresistible confection made of peanut butter and chocolate. The masterful showfront for this food concession is ablaze with advertisements for deep-fried treats: Oreos, Snickers, S’Mores, Twinkies. There’s even a Deep-fried Peanut Butter and Jelly Sandwich and a Deep-fried Grilled Cheese. 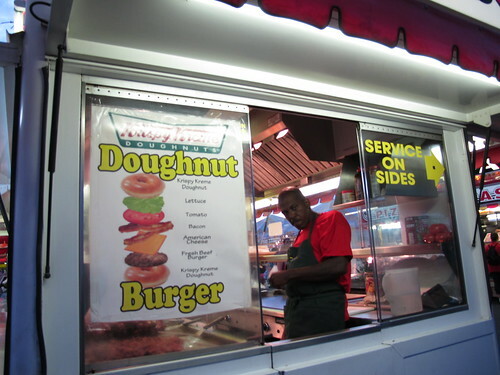 The most over-the-top food at the Meadowlands Fair is the Krispy Kreme Doughnut Burger, which is breakfast, lunch and dinner rolled into one, and is on the menu at Little Richard’s Cafe. 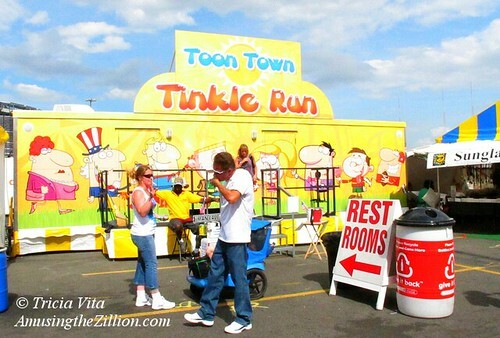 Or Toon Town’s Tinkle Run. 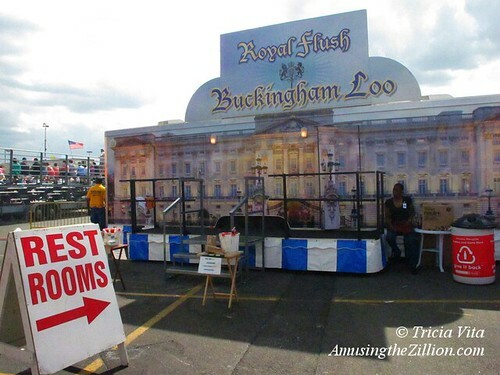 The clean and attractive portable restrooms are staffed by attendants. 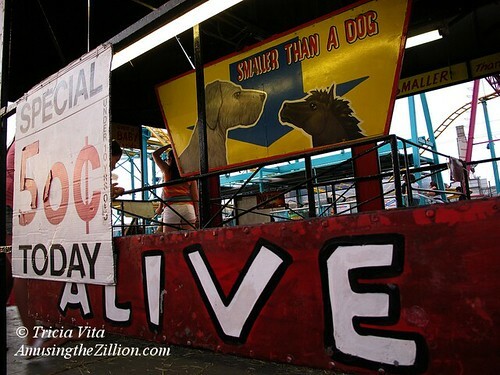 State Fair Meadowlands runs from June 21 through July 7 and also features an array of rides and free shows including Circus Maximus, Rosaire’s Royal Racing Pigs, Fireworks, and the last Nathan’s Hot Dog Eating Qualifier before the July 4th contest in Coney Island. 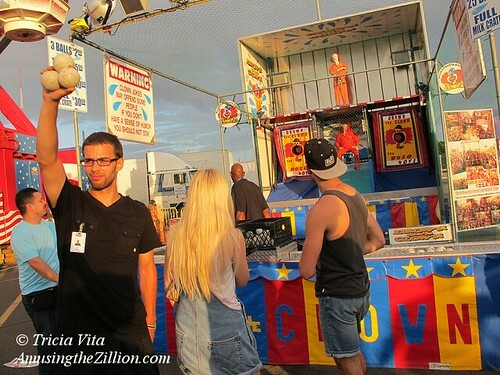 We took NJ Transit from Penn Station to Secaucus Junction and then hopped on a free shuttle bus to the fair. Trip time: 25 minutes.